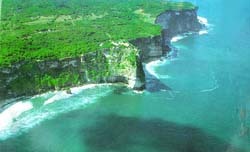 Connected to the mainland by a low, narrow isthmus, the limestone tableland of Bukit peninsula, at 200 meters above sea level, is in striking contrast to the lush Bali mainland. Cacti grow upon this arid land. 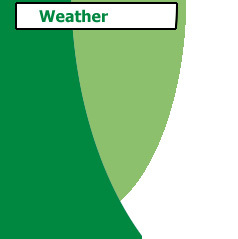 Some parts are used for grazing cattle. A good surfaced road meanders across Bukit to its western tip, where rocky precipices drop almost one hundred meters to the ocean. 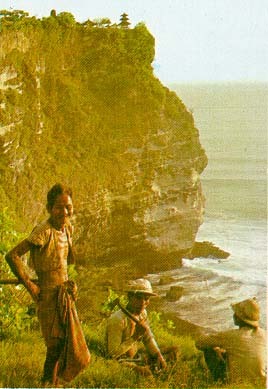 The small sea temple of Pura Luhur Ulu Watu balances picturesquely on the cliff's edge. Perhaps dating from the 10th century, it is one of the six prominent temples revered by all Balinese. Honoring the protective spirits of the sea, the temple has an unusual arched gateway capped by a Kala head and flanked by fine statues of Ganesa. At the end of his life, the priest Nirartha chose this spot to achieve moksa, deliverance from this life. Vantage spots on the Bukit road afford vistas of the heartland of Bali rising to the peaks of distant volcanoes.